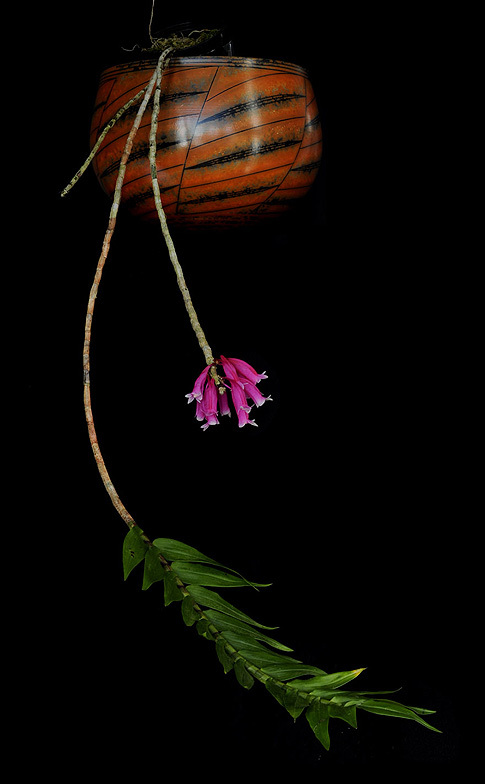 The growth habit of this orchid species from SE Asia is remarkable: the long thin pseudobulb hangs down from a branch, held by its roots, and the blooms grow facing down to the earth. 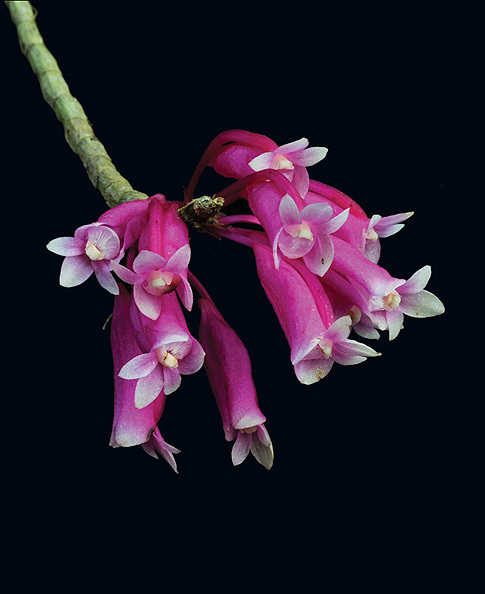 Yet the thin tube with nectar at its tip (the "nectary") grows back up towards the sky. And so when we take this essence, there is almost always a pronounced postural change noted: the head tilts forward, and yet there comes a sense of energy moving back up through the head, arcing from the face through the brain and back up out the rear top of the head. This is then followed by a deep, lasting stillness of being. Negative flames of thought are snuffed out like little candles with a snuffer. There is a sense of the Higher Self calling one's soul to remember its deepest and highest potential, to reach towards the inner beauty of enlightenment, yet remaining calm, rooted and centered. There are in our range several essences (Crown of Consciousness, Secret Wisdom, Behold the Silence, Pushing Back the Night, Guardian of the Inner Journey, Wisdom of Compassion and Serene Overview amongst others) which are deeply appropriate to take whilst meditating. Celestial Siren is also one of these, as it invites a deep inner stillness. If the vital forces of the body are blocked or low, then it would be good to work also with Vital Core essence, as the physical body needs the energy of its lower chakras working well and harmoniously, for the higher inner journey of spirit to fully unfold.